The process of providing a conduction path through which static electricity can escape to the ground (which has enough bulk and humidity to conduct it away) is known as grounding (it was already mentioned in section (7) as one way of increasing the safety of home wiring). If you work with computer chips (tiny electric circuits and components, etched on silicon) you should always take care to ground your body, e.g. by first touching a grounded object (say, the wall of the room or some big metal object), before touching the circuitry. For your body might carry a static electric charge--developed, say, by friction of your shirt or blouse, or your shoes and the rug--and when you touch the chip, some of it may jump over and damage the delicate circuitry ("zap" or "fry" the chip). The risk is particularly high in modern offices, where even in the summer air is kept dry by air conditioning, where the floor is paved with insulating tiles and the workers are likely to wear shoes with rubber soles. The amount of static charge produced by friction is very, very small--compared to, say, the charge transmitted each second by 1/1000 of an ampere ("one milliampere"). That is why even a thin layer of moisture on one's hand can discharge it. In grounding electric circuits in the home, on the other hand, a substantial copper wire is needed. Copper is the preferred conductor in commercial applications, in the wiring of homes and vehicles, and in motors. Silver is a better conductor, and gold is better still, which is why it is used (as a coating, in tiny quantities) in some precision microcircuits. Weight for weight, aluminum beats out copper, too, but (as noted at the end of sect. 13) it is rarely used in wiring, because it reacts chemically with the oxygen in air to produce a thin insulating surface layer, whose high resistance can cause local heating and even start a fire. Tidbit Silver is also a very good conductor of electric current. In the "Manhattan Project" of World War II, aimed at harnessing nuclear energy, large electromagnetic devices ("Calutrons") were built to separate the isotope uranium-235 needed for nuclear fission, from the much more plentiful (99.3%) isotope uranium-238. Copper for wiring those electromagnets was in short supply, but since all nuclear research was conducted in secret guarded locations, someone had the idea of borrowing silver from the national treasury at Fort Knox. The treasury was not exactly enthusiastic to help, but it consented, and tons of silver were converted to insulated electrical wiring. The silver was returned to the treasury after the war and according to the story, everything was accounted for. Like the electrically polarized straw of the preceding section, a metal rod on an insulating stand will also be "polarized" by a charged object held near one end. Suppose the charged object, on an insulating stand, has a net negative charge, as drawn. In an electrically neutral object near it, also on an insulating stand, positive charge will be attracted, while negative charge will be pushed to the other end. Using a grounded wire, we can now drain the negative charge from the negative end (drawing). If that wire is disconnected while the charged object is still in place, the metal rod remains with a net negative charge, and it will stay negatively charged even after the original positive charge which caused the polarization is removed. In demonstrations of static electricity, metal objects are often charged this way. The most dramatic example of grounding is of course the lightning rod, introduced around 1750 by Benjamin Franklin (1706-1790), later one of the founding fathers of the United States. A printer by trade, Franklin lived in Philadelphia, Pennsylvania, and the study of electricity was just one of his many side interests (others included the Franklin stove, the US Post Office which he founded, the "Poor Richard's Almanac," magic squares, the government of Pennsylvania, an intellectual club "Junto" and the first public library in the US). 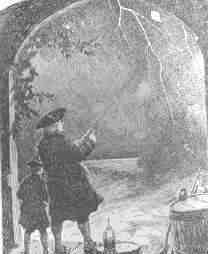 Suspecting that lightning was an electrical phenomenon, Franklin in a famous experiment flew a kite beneath a thunderstorm and extracted elecrical sparks from a key hanging from the end of the kite string (some critics have claimed he described the experiment without actually performing it). Even though Franklin claimed he carefully separated himself from the kite--standing in the dry area beneath an overhang, with a dry insulating string between him and the wet kite string--it was a foolhardy thing to do. G. Richman, a Russian scientist in St. Petersburg, tried to repeat the experiment shortly afterwards and was killed when a stroke of lightning came down the line. Today scientists at the Langmuir Lightning Laboratory in New Mexico bring lightning to their instruments from overhead thunderstorms by launching into them small rockets trailing thin metal wires. A lightning rod is a vertical metal rod rising above the highest point of a building, connected to a stake in the ground (or a substantial water pipe) by a thick copper wire held by posts outside the walls. If lightning strikes the rod, the electric charge is channeled safely to the ground, without passing through the building where it might endanger lives, start a fire or destroy equipment. The electric charge of lightning is apparently created by friction of frozen raindrops (like hailstones) blown upwards by updrafts in thunderclouds, hitting other such hailstones on their way back down. More is given at the end of the section on the Van de Graaff voltage generator. Erupting volcanoes also create lightning, probably by a similar mechanism, when stones thrown upwards from the crater hit others falling down again. Lightning does occasionally hit power lines, causing short spikes of high voltage, which can destroy computer chips. Computers and other electronic devices are therefore often protected by special attachments of "nonlinear" materials which deviate markedly from Ohm's law. With low voltages, they draw a negligible electric current, but they give way to sudden high voltage pulses and divert them safely before they cause damage. That protection is in addition to the one by circuit breakers, which might not react quickly enough. Ben Franklin's time saw a hot debate on whether electricity consisted of one fluid or two. Assuming (for instance) that a negatively charged object contained extra amounts of a negative electric fluid, the question was whether a positively charged object contained a deficiency in the same fluid, or the presence of a second kind. Ben Franklin supported the "two fluid" explanation, and today we tend to agree, having observed electrons and nuclei, atomic carriers of (–) and (+) charge. However, he also chose the naming of positive and negative electricity. Much later it was realized that reversing the choice would have made more sense, because most common electric phenomena, e.g. conduction of electricity in metals, involve the motion of electrons, carrying what Franklin named a negative charge. By then, however, it was much too late to change the convention. "I often say that when you can measure what you are speaking about, and express it in numbers, you know something about it; but when you cannot measure it, when you cannot express it in numbers, your knowledge is of a meagre and unsatisfactory kind"
It was Newton who first discovered around 1680 that the observed motion of planets and their moons could be precisely calculated from some fundamental laws of motion and gravity. About a century later a French military engineer, Charles Augustine Coulomb, made it possible to calculate and predict the motion of electric charges in a similar manner. It is therefore only fair that the unit of charge is named "coulomb" in his honor. Military engineers in 18th century France (and later) were well trained in science and made many important contributions to it. In his official capacity Coulomb supervised the building of fortifications on the Caribbean island of Martinique, and later, in France, the construction and maintenance of canals, ports and of the royal waterworks which fed the exquisite gardens of Versailles. He also conducted scientific studies of sliding friction, discovering that besides depending on the nature sliding surfaces, it was approximately proportional to the force holding them together, regardless of the contact area--e.g. when a brick-shaped block of wood was dragged along a flat horizontal surface, the force of friction was approximately the same no matter which side it rested on. By 1773 it was well known that the direction of the compass needle underwent a regular 24-hour cycle, a tiny variation just barely observable even with oversized compass needles. The Paris Academy of Sciences therefore offered a prize for the most sensitive compass instrument, which might perhaps help investigate this phenomenon. The prize was awarded in 1777 and part of it went to Coulomb who studied the variation with a magnetic needle suspended by its middle from a long silk thread inside a glass container (Figure) . The instrument was adopted in 1780 by the Paris observatory and worked very well, but it was noted that the needle sometimes jumped when the observer touched the eyepiece of the microscope used for observing its tip. Coulomb correctly credited static electric charge on the observer. He had the instrument moved to a basement whose humid air reduced static charging (and whose temperature was less variable), and instructed observers to wait a few minutes near the instrument before touching it, to give any charge on their bodies a chance to leak away. Coulomb's instrument, however, could do much more. It became known as a torsion balance--torsion is the twisting force of a string (here, the one of the suspension), which is balanced against some other force. The string hung from a knob which could be turned, and the size of the force could be deduced from the angle be which the string had to be turned to bring the needle back to its first position. Coulomb quickly realized that here was an ideal instrument to measure the feeble force between electric charges. He replaced the magnetic needle with an insulating dry straw, with a small ball of pith (lightweight plant material) at one end, balanced by a paper vane whose air resistance helped the straw stop swinging and settle into equilibrium. A second, identical ball of pith was mounted on an insulating shaft, and lowered next to the first one, at the same distance from the axis of the thread. The ball was then charged with static electricity. By having the balls touch, Coulomb made them share their charge--equally, because they were alike--and the twisting of the knob allowed the force of their repulsion to be measured, at a given distance. Twisting the knob more or less also changed the distance, and in that manner Coulomb could show that like gravity, it varied inversely with the square of the separation distance r -- in other words, it was proportional to 1/r2 . Discharging the fixed ball and sharing the remaining charge by touching, so that each electric charge q was reduced to one-half, Coulomb found that the force dropped to 1/4. That suggested the repulsive force F between two charges q1 and q2 was proportional to the size of each of them. In a formula F = k q1 q2 / r2 where k is some constant, depending on the units in which F, q1, q2 and r are measured: or else, by choosing k=1 or some other fixed value of k, the unit of electric charge could be defined. This formula was the beginning of electricity as an exact science! Coulomb also proved that attraction varied as the square of distance, a more difficult experiment, and that magnetic poles obeyed a similar law. He described his results in 6 reports published in 1785-90. Coulomb's method was adapted by Henry Cavendish in Britain to devise a measurement of the force of gravity in the laboratory. That is a much more difficult observation, because the attraction between to spheres is much, much weaker than the electric or magnetic forces measured by Coulomb. Also, because the spheres must be massive (to generate enough gravitational force), the motion of the suspended pair of spheres is very slow, due to inertia. Nevertheless, by 1796 Cavendish performed that experiment and showed that the pull of gravity between two masses varied like 1/r2, not just between planets and moons (as Newton had shown) but also between masses in the laboratory. Thus all three forces studied--magnetism, electricity and gravity--seemed to display a pleasing symmetry. All three were directed from one center of force to another, and all varied with distance like 1/r2. True, magnetic poles only came in matched pairs, and gravity always attracted, it never repelled. But apart from such differences, nature was remarkably orderly and symmetric. Or so it seemed up to 1820.